Ok- I think that it's safe to talk about this now since I think everyone has received their "surprise" in the mail. A few weeks ago I saw this post on the Givers Log and it totally inspired me. 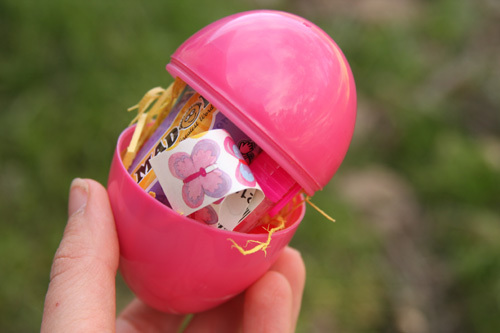 She mailed out plastic Easter Eggs stuffed with candy and small toys to friends and family. How cute is that? I had to try it out. I bought a few packs of the jumbo plastic Easter Eggs, some candy, and Easter grass- about $5 in supplies. Then filled them up with a little note from our family. I taped them up really well, I was hoping they wouldn't get smushed and explode in the mail. I felt like the Easter Bunny when I dumped the eggs onto the counter at the Post Office- "I'd like to get these weighed please?". The workers got a kick out of it, I suspect they don't get things like this handed to them very often. Other patrons thought it was fun as well. I'm hoping my little cousins think the Easter Bunny came a little early this year, and hoping to bring a smile to my family and friends face. This is a fun and easy project. 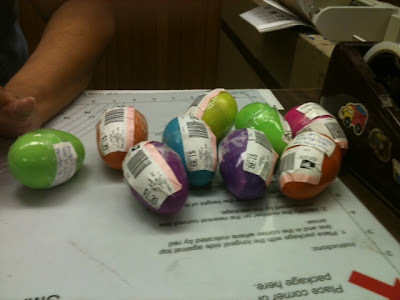 The supplies are cheap and the postage was only about $1.40 per egg. What a great idea. I might have to do that for my god children. One is in college - I would love to see her face when she opens the mailbox and sees and egg from me! I love this idea of sending funny things in the mail without an envelope or box. I bet everyone will love their surprise! This is the best idea ever! Cuteness. What an adorable idea! I have some nieces and nephews that are going to be tickled when they receive one in the mail. Thanks for sharing. Love it! I'm going to have to do this for my friends and family! Thanks for posting! Thanks for passing on this FUN idea! Such a sweet thing to do! I never would have guessed that you could mail Easter eggs! This is EGG-CELLENT!!!! First of all, I loooooove snail mail. Second of all, I love snail mail that is egg-citing like this!! I am definitely making this happen. Thank you for sharing!!! Oh my gosh, how fun is that?!!! I love it! I would LOVE to have you share this at my For the Kids Friday Link Party (still open). Stop on by and join the fun! Btw, I'm following from Swingin' by Sunday and hope you will join my Spring Blog Hop, too. Oh my gosh! This is fantastic! I love this idea. I know I would LOVE to get an egg in the mail! I'm so going to steal your idea and do this. I will link back to you =o) Thanks. You are brilliant!!!! I never know you could mail an egg! Would love to see you share it at my link party! Love your surprise eggs!!! I hope you'll stop by the Pretty Packages Party and share them. I had NO IDEA you could mail eggs just like that! I wonder if I could get them sent internationally. Maybe big ones would work so there's room for customs forms... Hmmm!! Very cool! This is too cool! I shared your post with my Facebook friends. Thanks so much for sharing this at my For the Kids Friday Link Party! I appreciate you stopping by. This week's party is now posted, so stop on by. I'd love to see what you have to share this week! Great idea with a nice personal touch! It beats a card I'm sure. I tried to do this today and the postal service gave me a big fat, "NO." :( Can you tell me what kind of postage you used to send these? The label on your eggs looks vastly different from the label my postal worker showed me — hers was huge! And since it was too big for the egg, she insisted there was nothing she could do.